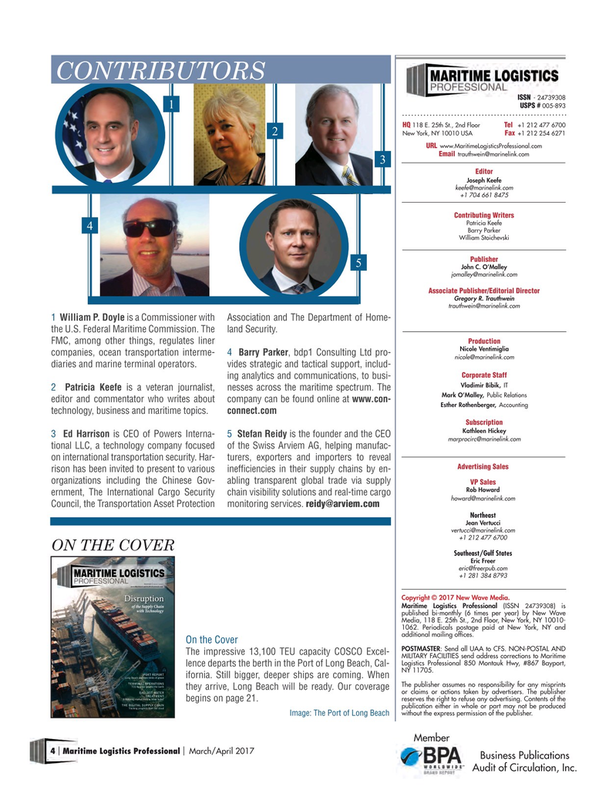 Gregory R. Trauthwein trauthwein@marinelink.com 1 William P. Doyle is a Commissioner with Association and The Department of Home- the U.S. Federal Maritime Commission. The land Security. Copyright © 2017 New Wave Media. Media, 118 E. 25th St., 2nd Floor, New York, NY 10010- 1062. Periodicals postage paid at New York, NY and additional mailing of? ces. A Maturing market ?nds a ‘silver bullet’ reserves the right to refuse any advertising. Contents of the begins on page 21. Tracking progress from the cloud without the express permission of the publisher.